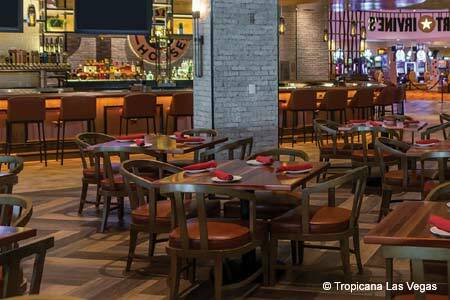 A modern and vibrant steakhouse with a loungy ambience. 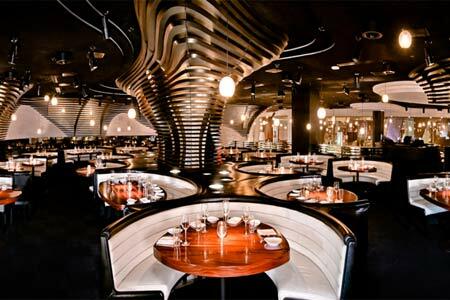 : STK may be missing the vowels in “steak,” but it does not lack the accoutrements of a modern steakhouse. At the helm is executive chef Stephen Hopcraft, who has appeared on Bravo’s "Top Chef" and Food Network’s "Chefs vs. City." Design elements include a central lounge furnished with creamy leather banquettes, and an elevated dining room featuring smoky mirrors and theatrical lights illuminating each table. Seafood lovers will enjoy the seafood platter, a mix of pickled prawns, Kusshi oysters, king crab and Maine lobster. Steaks come in plate sizes of small, medium and large, with a choice of cuts including skirt, filet, sirloin, bone-in rib and porterhouse. An STK staple is the king crab salad, a mix of avocado, honeydew, makrut lime and organic mâche. Don’t miss the truffle Parmesan french fries and the mushroom potpie, which doubles as a topping for steak. Creative desserts include a trio of cheesecake lollipops, covered with a coating of white chocolate, milk chocolate and dark chocolate, flavored with vanilla, raspberry and caramel. A distinctive wine menu emphasizes selections from California and also includes options from Italy, France and Australia.